Are you looking for an all-in-one company to take care of your company’s comfort, renovation or metal fabrication work? How about a subcontractor to turn your general contracting project around efficiently? The Tuckey family of companies does it all. Let our five decades of experience speak for itself when you count on us for your specialty construction and manufacturing needs. We serve the South Central Pennsylvania region, including Harrisburg, Carlisle, Chambersburg, and York, PA.
Tuckey Mechanical Services, Inc. completes HVAC, electrical, and plumbing projects for commercial clients and general contractors alike. Tuckey Metal Fabricators, Inc. offers custom systems fabrication services, welding, millwrighting and rigging, as well as additional metal fabrication services. Tuckey Restoration, Inc. specializes in renewing properties with historic preservation, remodeling, mold remediation, and property damage restoration. Rely on us to offer a full selection of turnkey solutions for your general contracting or business needs. Our clients consider us their one-stop-shop for everything related to construction, facility maintenance specialties, and manufacturing. We have one of the highest levels of experience in HVAC services throughout South Central Pennsylvania. 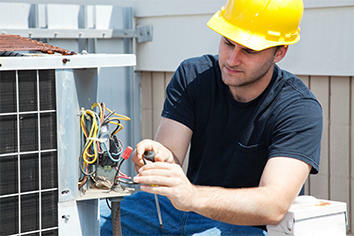 If your business needs HVAC repairs or replacement, let us sell and install your new equipment. Contractors can focus on their new constructions and leave the HVAC setup to our team of subcontractors. When you need a wiring project done well, you want a service provider like Tuckey who gets it right the first time. Our electricians have broad skills that qualify them to service any size space. We provide subcontracted installations in new construction projects and help businesses power their facilities. Just as electrical projects need the utmost care and attention, so do plumbing jobs. The Tuckey team designs, installs, and repairs full-scale plumbing systems and equipment. Let us build a system from the ground up for your new construction. Or, count on us to keep your business’s plumbing working efficiently. Tuckey Metal Fabricators uses state-of-the-art technology and tools to serve businesses of all sizes. Household names like IBM and Harley Davidson trust us to make custom designs. However, we give the same dedication to local companies because we promote quality in everything we do. If you have a large-scale solution in mind, we handle project development and ongoing maintenance. Hire our subcontractors for a second opinion on any aspect of your new construction. Or, ask us to manage your commercial construction during every phase. Once we finish building, we can keep your facilities in top shape. This page offers only a glimpse at the Tuckey family of companies’ capabilities. To learn more about what we have to offer, get in touch with us online. One of our customer representatives will get in touch to answer your questions. "Our company has been using Tuckey for many years. Their prompt service has gotten us out of many situations even in the middle of the night. Mike is usually our service tech and he always goes above and beyond. If you want the job done right with good workmanship, I highly recommend Tuckey."